Christina received a grant from Mondo in September 2015. She has now been able to take a low interest loan of 300,000 TZ Shs in order to expand her business. 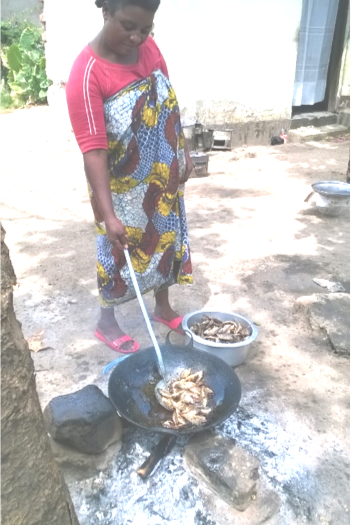 We found Christina frying fish for either the lunch time trade or for people to add to their evening meal. She was reaching the end of a large bucket of fish that she orders every evening and which gets delivered from Nyumba ya Mungu, a large dam on the Pangani River just out of Moshi. Thanks to her first loan from Mondo she has been able to add this business to her existing business, making vitumbua ‘sweet rice bread’ for the early morning market. The new loan went towards buying her first bucket of fish, an additional jiko (cooker) for frying the fish, buckets, oil, cooking spoons and saucepans. Christina outlined her day for us: she is up early to cook the vitumbua and starts cooking the mixture that has been standing since the evening before and these need to be ready for sale, at the door, or for delivery by her daughter on her way to school. When the cakes are cooked, Christine starts cooking the fish. She has finished cooking the 20l bucket full of fish by 2pm and the fish are ready for sale from the door. She has a short break to rest and then she starts to prepare the mixture for the vitumbua for the next morning. Kiri her eldest daughter is a great help, she is now at home awaiting the results of the national examinations to see if she can go on to Form 5. Kiri not only delivers the morning vitumbua but also helps prepare the next day’s mixture. Already there are improvements in Christina’s living conditions: she has managed to save enough to put towards getting piped water in her house and she has also been able to pay for Tanesco to install an electricity meter which means that she no longer has to cook by Aladdin lamp in the morning and she can prepare the mixture more easily too. If you would like to help support more women like Christina, we are currently raising funds for our next round of grants and loans. To help us achieve our target you can donate here.